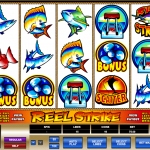 Fishing enthusiasts will be thrilled when they find out about Reel Strike, a video slot game from Microgaming. 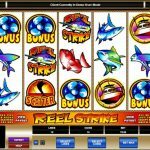 Brag with your catch of the day in this action packed slot. Some say that fishing is not a sport, but they obviously did not see an episode of “Deadliest Catch” before. It is risky but when you succeed you feel an adrenaline rush, just like in any other sport. If you do not have an open sea in sight you can still try your strength and test your boundaries with this game. There are a couple of symbols in Reel Strike that you want to see more often than the others. First we have the fish on a hook which is the scatter, then the fishing rod which is the wild and the propeller is the bonus symbol. The scatter symbol offers scatter payouts only and it does not activate any feature. What is unusual here is the wild symbol. It substitutes for any symbol in order to create a winning combination, but at the same time it substitutes for the bonus symbol as well and it can activate the main feature. The free spins feature is pretty standard. The only different thing might be that you have to pick one of 6 boats to reveal the number of free spins and then another boat to reveal the multiplier. You can win between 2 and 7 free spins and between x 1 and x 7 multiplier. 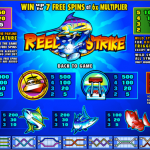 We hope that by now we convinced you that Reel Strike is one heck of a game coming from Microgaming. There is only one special feature but it is enough considering the fact that it is triggered quite often. Sometimes even weird little games can be fun! Munchkins a 5 reel slot by MicroGaming, is exactly that.